For the phobia, see triskaidekaphobia. The Fear of 13 is a 2015 British documentary film. It tells the story of Nick Yarris, who was convicted of murder and spent 21 years on Death Row in Pennsylvania. He was released in 2004 when DNA evidence proved he was innocent of the crime. Nick Yarris tells his true life story, in the style of a one-man show. In a non-linear structure, he reveals his early life, youthful transgressions, arrest, and time on death row, with several twists and turns. No one else appears on screen. Supplementary footage and sound effects are included as Yarris describes events. The title refers to the word triskaidekaphobia, one of many words which Yarris learned while educating himself in prison. 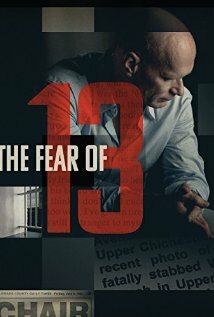 The Fear of 13 premiered at the 2015 London Film Festival, where it was nominated for Best Documentary Film. It had a positive reception; on the review-aggregate site Rotten Tomatoes the film has a 92% approval rating, based on 12 critics, with an average rating of 7.7/10. Time Out ranked it with four stars out of five, with the summary "This death row documentary sets up an intriguing mystery that'll keep you gripped until the final moments". The Times also gave it four stars, and praised Yarris's storytelling skills: "The Fear of 13 is riveting and that’s mainly due to its extraordinary subject". Mark Kermode awarded the film three stars, and summarised its themes by writing "Yarris leads us on a labyrinthine journey that has as much to say about the art of storytelling as it does about the iniquities of crime and punishment." ^ "59th BFI London Film Festival announces 2015 juries for First Feature Competition, Documentary Competition and Short Film Award". British Film Institute. 23 September 2015. Retrieved 16 January 2016. ^ "The Fear of 13". Rotten Tomatoes. Retrieved 16 January 2016. ^ "The Fear of 13". Time Out. ^ "The Fear of 13". The Times. ^ Kermode, Mark. "The Fear of 13 review – gripping first-person account from death row". The Guardian. This page was last edited on 27 February 2019, at 10:53 (UTC).